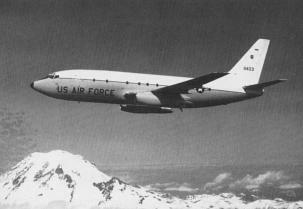 The T-43A is the Air Force version of the Boeing 737-200. The exterior differences between the military and commercial aircraft were that they had just 9 windows each side of the fuselage and door 1R and 2L were not fitted. There were also many small blade-type antennas, 5 overhead sextant ports and a wire antenna for HF radio. They were fitted with an 800 USGal auxilliary aft centre tank as standard. The T-43A is equipped with navigation and communications equipment to train navigators for strategic and tactical aircraft. It is primarily used in the USAF's undergraduate navigator training program. Six T-43As are configured for passengers (as the CT-43A) and provide operational support to assigned commands and the Air National Guard. There is also one NT-43A radar test bed (see below). The aircraft has considerably more training capability than the plane it replaced (the T-29C, similar to a CV340). Inside each T-43A training compartment are two minimum proficiency, two maximum proficiency and 12 student stations. Two stations form a console, and instructors can move their seats to the consoles and sit beside students for individual instruction. The cabin floor was strengthened to take the weight of these consoles. The large cabin allows easy access to seating and storage, yet reduces the distance between student stations and instructor positions. 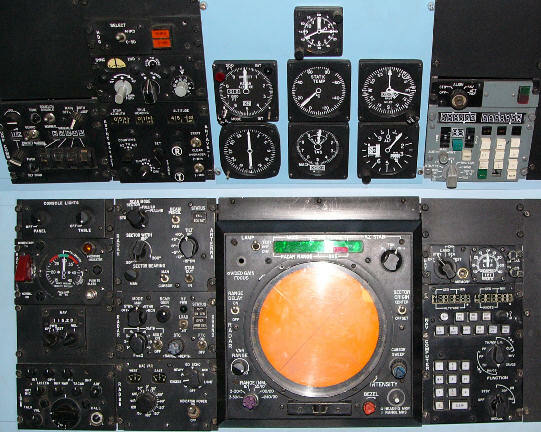 The student training compartment is equipped with advanced avionics gear identical to that of Air Force operational aircraft. This includes doppler and mapping radar; LORAN, VOR, TACAN, INS, radar altimeter; UHF & VHF comms. Five periscopic sextants are spaced along the length of the training compartment for celestial navigation training. The first T-43A was delivered to the Air Force at Mather Air Force Base, Calif., in September 1973. The last deliveries were made in July 1974. 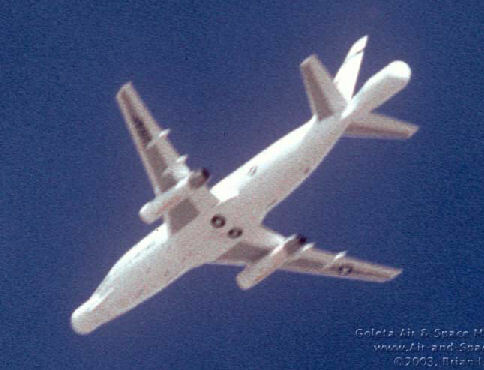 Air Education and Training Command's T-43 fleet relocated to Randolph Air Force Base, Texas, in May 1993 when Mather AFB closed. Gradually most of the T-43's went into storage with AMARC at Davis Monthan AFB near Tucson, Arizona. However one (tail number 73-1155) was recovered in March 2000 and flown to an aircraft maintenance and modification facility at Goodyear, Arizona for conversion to a radar test bed. This required the installation of two oversized radomes on the nose and tail. Its first flight in this new configuration was on 21 March 2001. The radomes were built by the Lockheed Martin Advanced Prototype Center, part of the Advanced Development Programs' (ADP) organization for Denmar which is a company specializing in stealth technology. The "Den" stands for President Denys Overholser, the former Skunk Works engineer credited with devising the shape of the first stealth aircraft. The design, fabrication and machining of the structure's components were all performed at Palmdale. The radome structure is about 6.2 feet in diameter and 16.5 feet in length and made of a 90-percent carbon epoxy/honeycomb sandwich material, with machined aluminum parts, and houses an airborne radar assembly. The NT-43A can be seen flying in formation with various stealth aircraft, here the Northrop B2, usually in the radar free environment of Death Valley. It makes radar images of these aircraft to evaluate their stealth characteristics. This images can used to reveal the rate of degradation of the radar deflecting and absorbing components as the aircraft age, and to determine the effectiveness of maintenance and repair methods. Spent 15 years in Janet Flight from 1980-1995, then became a testbed. RANDOLPH AIR FORCE BASE, Texas-- The last combat systems officer training aircraft was retired from service in a ceremony here Sept. 17. 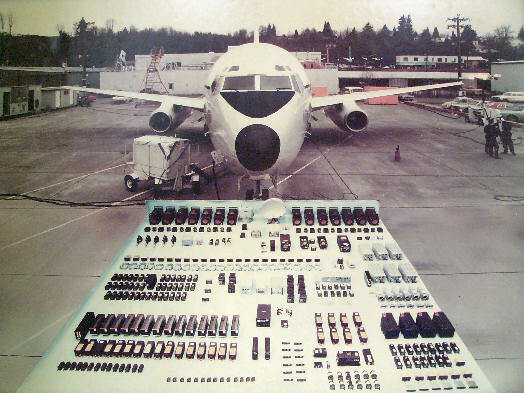 The T-43, also known as the 'Gator,' is a version of the Boeing 737, and has served as a training platform for navigators, now known as combat systems officers, since 1973. "We call it the flying classroom," said Lt. Col. Pete Deitschel, the commander of the 562nd Flying Training Squadron, one of two T-43 training squadrons at Randolph Air Force Base. "It's designed for undergraduate navigator training. We are using the term combat systems officer now, just because of what our students do in the operation world. It's not necessarily navigating from point A to point B anymore. 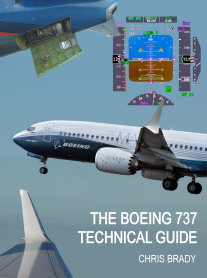 It's incorporating all the systems on an aircraft." Originally based at Mather AFB, Calif., the T-43 has been in service at Randolph AFB since 1992. "The T-43 has been a workhorse of navigation," Colonel Deitschel said. "We have put more than 20 thousand aviators through the training. Along with that, our sister services have benefitted from this aircraft. Just two years ago, we had Navy students come through our training program. Until 2004, the Marines also put their navigators through our training program. We've also (had) 37 ... different countries that put students through our training." Col. Richard Murphy, the commander of the 12th Flying Training Wing, said the T-43 has been a safe and reliable aircraft throughout its 37-year history. "The T-43 has flown five hundred thousand training hours (and) 100 thousand training sorties, all mishap free," he said. "But now it's time to bid farewell, as we transfer our training down to (Naval Air Station) Pensacola, Fla., where our CSO students will fly T-6 (Texan IIs), T-1 (Jayhawks) and a modified electronic warfare simulator." With advances in technology and the ever-changing needs of the Air Force, Colonel Deitschel said the T-43's retirement is a step forward for the Air Force. "We're updating systems," he said. "This aircraft was designed to do celestial navigation, as the primary training platform for that, where we would teach students how to navigate using the sun, the stars and the moon. We don't do that anymore. With the onset of the newer systems in the Air Force, (from) global positioning satellite systems to more advanced radar systems, we've gone away from that type of navigation." Additionally, as CSO training transitions away from the T-43, Colonel Deitschel said the nature of the training will change as well. Instead of having 12 CSO students training aboard the aircraft at one time, as was the case with the T-43, only one student will be aboard the T-6 or the T-1 at any given time. "It was more beneficial to the Air Force to switch to two smaller aircraft, where we can put more students in the air, doing all the navigation," he said. "When you have 12 students on board an aircraft, you can only have one that's actually navigating the aircraft. When we go to a smaller aircraft, that one navigator, or combat systems officer, is doing the navigation by (him or herself)." In addition to accolades for the aircraft itself, officials praised the people who have served aboard the T-43 throughout its tenure. "The T-43 instructors have pushed their students to the limit for 37 years, and in the process, provided them with the tools of the trade," said Col. Andrew Croft, the commander of the 12th Operations Group. "Students learned radar and ground-based navigation techniques, along with inertial navigation systems, allowing them to precisely find their way in the worst of weather. "It's been an honor to have this aircraft serve in our group," Colonel Croft said. "All the men and women who flew aboard the T-43 are to be commended for their service, and for the (T-43), this is 'mission accomplished.'" The T-43 retirement ceremony concluded with a final composite flyby of Randolph AFB aircraft including the T-43. The aircraft will now take its place in aviation history, and a T-43 will be placed on static display at Randolph AFB.